The Commission on the Status of Women (CSW or UNCSW) is a functional commission of the United Nations Economic and Social Council (ECOSOC) and one of the main United Nations organs. The Commission on the Status of Women is the United Nations’ organ that promotes gender equality and the empowerment of women. Every year, representatives of Member States gather at United Nations Headquarters in New York to evaluate progress on gender equality, identify challenges, set global standards and formulate concrete policies to promote gender equality and advancement of women worldwide. 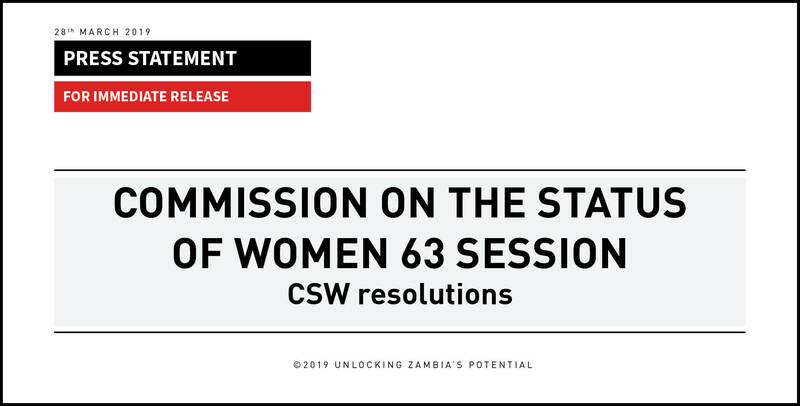 This year’s CSW marked the 63rd session under the theme “Social Protection Systems, Access to Public Services and Sustainable Infrastructure for Gender Equality and the Empowerment of Women and Girls”. On the 17th of March 2019, the Commission released a draft of agreed resolutions aimed at addressing the various gender disparities that women face globally. It is pleasing to note that there has been progress towards women’s and girls’ access to social protection, public services and sustainable infrastructure, particularly in the areas of health and education. This is evident from the global increase in social protection coverage, more girls attending school as well as access to affordable and quality essential health-care services. The Commission however, recognized significant challenges which include gender gaps averaging 32% which remain to be closed according to the 2018 Global Gender Gap Report. The progress that has been achieved over the years is threatened by budget cuts and austerity measures and multiple and intersecting forms of discrimination faced by women and girls. The Commission stressed the importance of addressing these remaining gaps, as well as inequalities, structural barriers and biases that constrain equal access to social protection systems, public services and sustainable infrastructure. The Commission reaffirmed the right to education and stressed the need for equal access to high quality, affordable, accessible and inclusive education in contributing to the achievement of gender equality and the empowerment of all women and girls. It noted with concern the lack of progress in closing gender gaps in access to, retention in and completion of secondary and tertiary education and emphasized the importance of technical and vocational training and lifelong learning opportunities in achieving sustainable development. A healthy population is the desire for all nations and it is for this reason that the Commission recognised the need to target and eliminate the root causes of gender inequality, discrimination, stigma and violence in health-care services. The Commission also reiterated the need for Member States to promote universal health coverage that comprises universal and equitable access to quality health services and ensures affordable and quality service delivery through primary health care. Social protection is one of the key instruments of reducing inequality and poverty. Many countries have adopted various social safety nets aimed at uplifting livelihood of vulnerable and marginalized groups. The Commission was concerned with the social protection coverage gap especially for women in some countries which goes against a person’s right to a standard of living adequate for the health and well-being of themselves and their families, including food, clothing, housing and medical care and necessary social services. Poor infrastructure, water and sanitation remains a challenge in many developing countries. The Commission was concerned that women and girls are particularly affected by water scarcity, unsafe water, inadequate sanitation and poor hygiene, and that they shoulder the main burden of collecting household water in many parts of the world, restricting their time for other activities, such as education and leisure, or for earning a livelihood. The Commission affirmed that accelerated investments in gender-responsive social protection systems, public services and sustainable infrastructure, along side gender-responsive macroeconomic policies that enhance job creation and livelihoods, are critical in tackling economic, social, environmental, legal and demographic challenges. These are important for the achievement of gender equality and the empowerment of all women and girls and inclusive growth on the path to sustainable development. PMRC would like to commend Government for its efforts in ensuring gender equality and the empowerment of women and girls throughout the country. PMRC would also like to urge Government to adopt its recommendations on increasing budget allocation towards the health and education sectors which are below international standards of fifteen and twenty percent respectively. Lastly PMRC would like to urge the private sector to supplement Government’s efforts by promoting gender equality and the empowerment of women and girls through empowerment programs as well as strengthening the mainstreaming of gender responsive planning and budgeting of all programs and projects.